Broad coverage of the literature. Apart from the page limitation, originality, relevance, quality and clarity are the only criteria for selecting the material to be published. A sound methodological basis is a requirement, but technical correctness alone is not sufficient for publication. The subject matter can be theory, methodology, empirical studies, and applications. The mainstream of contributions focuses on new models, theorems, algorithms, and experimental work that the author wants to disseminate rapidly. We will publish theory and methodology with proofs omitted or only sketched, provided that the author submits support material that enables us to verify the findings. We will also publish computational and experimental studies that are not necessarily based on new theory or methodology, but are of significant scientific value because they confirm or refute prior results. Similarly, we will publish reports on applications and case studies that demonstrate a novel use of existing techniques or contain significant ideas about data collection and analysis, modelling, or implementation. Operations Research Letters is committed to the rapid review and fast publication of short articles on all aspects of operations research and analytics. Apart from a limitation to eight journal pages, quality, originality, relevance and clarity are the only criteria for selecting the papers to be published. ORL covers the broad field of optimization, stochastic models and game theory. Speci?c areas of interest include networks, routing, location, queueing, scheduling, inventory, reliability, and ?nancial engineering. We wish to explore interfaces with other ?elds such as life sciences and health care, arti?cial intelligence and machine learning, energy distribution, and computational social sciences and humanities. Our traditional strength is in methodology, including theory, modelling, algorithms and computational studies. We also welcome novel applications and concise literature reviews. The area covers all issues relevant to the development of efficient approximate solutions to computationally difficult problems. Examples are heuristic approaches like local search, worst case analysis or competitive analysis of approximation algorithms, complexity theoretic results, and computational investigations of heuristic approaches. Papers in all fields of continuous optimization that are relevant to operations research are welcome. These areas include, but are not restricted to, nonlinear programming (constrained or unconstrained, convex or nonconvex, smooth or nonsmooth, exact or heuristic, finite or infinite-dimensional), complementarity, variational inequalities, bilevel programming, and mathematical programs with equilibrium constraints. 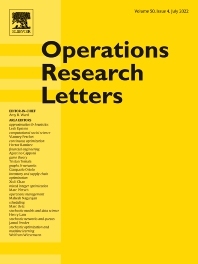 The area published papers in game theory with relevance to the field of operations research. The area seeks papers that apply, in original and insightful ways, discrete mathematics to advance the theory and practice of operations research, as well as those reporting theoretical or algorithmic advances for the area. Of particular, but not exclusive, interest are papers devoted to novel applications, telecommunications and transportation networks, graphs and web models and algorithms. The area welcomes innovative papers focused on inventory management. Examples of topics include, but are not limited to supply chain management, pricing, capacity planning, multi-item/echelon systems, algorithms and bounds, and incentive design. Operations research methodologies are used in the healthcare sector, for example, in treatment or clinical trial design, robotic surgery, location of healthcare facilities, medical resource allocation, and vaccine scheduling. Recently, operations research is likewise emerging as a crucial component of basic research in the life sciences, for example, in genome assembly, phylogenetics and network biology, structural biology and drug design. The area welcomes theoretical and applied contributions to these and related fields. The area solicits original articles dealing with theoretical and computational issues in linear optimization or optimization under stochastic uncertainty. The area includes topics related to operations management and supply chain design such as location problems, production planning, transportation and routing, and revenue management and pricing. We welcome papers that study existing or new models and applications in these areas and provide significant new results. Examples are papers introducing new models, new algorithms or new analysis of known models or algorithms. Emphasis will be put on the relative importance of the paper's contribution to known theory and practice. All submissions advancing the theory and practice of mixed integer (linear or nonlinear) programming like novel techniques and algorithmic approaches in convex relaxations, branch and cut, polyhedral combinatorics and theory driven heuristics are welcome. Case studies may be considered if they contribute to the general methodology. The area invites novel reliability and maintenance optimization contributions with a rigorous operations research component. Examples include, but are not limited to, stochastic models of reliability, dynamic maintenance decision making, novel uses of data within analytical frameworks, matrix-analytic methods and asymptotic results. The area will consider formal models, algorithms, bounds and computational advances. We seek original and significant contributions to the analysis and solution of sequencing and scheduling problems. This includes structural and algorithmic results, in particular optimization, approximation and online algorithms, as well as game theoretic modeling. All results are welcome as long as the relevance of a problem and significance of the contribution is made compellingly clear. The area focuses on networks and queueing systems where stochastic variability and uncertainty play a crucial role. The area seeks papers that propose original models and develop novel analytical or computational methods. Innovative ideas and broad results receive precedence over incremental extensions or niche areas.